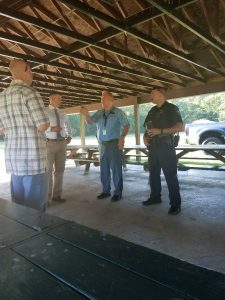 In our continuing efforts to strengthen community and law enforcement partnerships, the St. Mary’s County Sheriff’s Office and the Sheriff’s Citizen Advisory Board participated in a Country Lakes Homeowner’s Association Community (CLHOA) Meet & Greet on May 18, 2017. 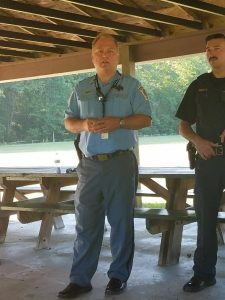 The following members of the St. Mary’s County Sheriff’s Office participated in the event: Patrol Division Commander, Captain Eric Sweeney; District One Commander/CLHOA Sheriff’s Office Liaison, Lieutenant Eva Jones; Narcotics Division, Lieutenant Richard Russell, Criminal Investigations Division, Sergeant Thomas Hedderich; Traffic Safety, Corporal Brian Connelly, and Patrol Deputy Daniel Holdsworth. 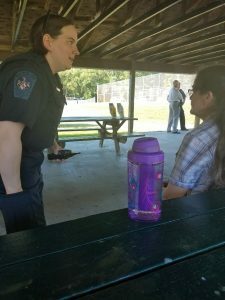 The Sheriff’s Office thanks the CLHOA for hosting this opportunity for their citizens to meet and interact with our personnel, and learn about criminal and traffic laws, as well as services provided for citizens by our agency. The agency offers a wide variety of services to citizens. Information on these services is available on our website www.firstsheriff.com. The Sheriff’s Office keeps citizens informed through our website news blog, social media outlets to include Facebook and Twitter, and through the Nixle Program. Citizens can sign up for Nixle, a free service, on our website to receive text messages and/or emails on local events and incidents, such as road closures. The Sheriff’s Office has also instituted a new On-Line Reporting System for minor crimes, suspicious incidents, and reporting lost items. Please see our website for guidelines on using this service. Anyone having any questions or concerns pertaining to the Country Lakes Subdivision may contact Lieutenant Eva Jones at 301-475- 4200 x*8069. 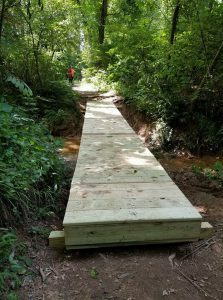 We would like to extend a very special thank you to Cody with Eagle Troop 1785 for taking the lead and completing a bridge and trail restoration project at the Country Lakes park. Cody approached the HOA board with the idea to repair the old worn bridges and clean the trails. We were happy to approve the project and it was recently completed in June. 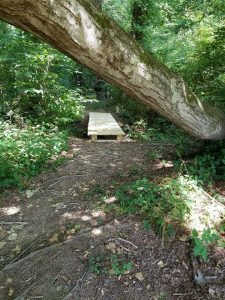 We hope you and your families and pets enjoy these trails, located in the wooded section along the existing walking path at the park. Please remember to keep your pets leashed at all times. Not all animals are as friendly with other unknown animals and people as they are with your own families at home. A leash will help avoid any unforeseen problems. Thanks for understanding! Park pavilion at 6-pm. All are welcome. Park pavilion at 6-8pm. Many of our community organizations and first responders will be in attendance with fun demonstrations, door prizes, food and games. Don’t miss it. Volunteers please meet at the park pavilion at 9am. Bring gloves and wear appropriate clothing for clean up. The HOA will handle removal of all filled garbage bags. Starts at 7am until you are finished! Set up in your yard or at the parking lot on Cox/Asher on a first-come, first-served basis. We will advertise online and post signs in the neighborhood.